This pattern is Peace Rose Garden Socks by Diane Edgerly (available for free on Ravelry) and I'm proud to admit fully that I CHEATED!!! 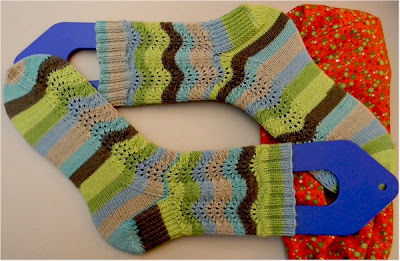 I used self striping yarn, rather than do all the color changes. This sock would knit up nicely in about any yarn. A spiraling stripe maybe not so much, but a lightly variegated, solid, kettle dye or self striping works nicely. If you choose to work this pattern yourself, do keep in mind, this pattern is designed to be more of a slouch sock as the leg is bigger around than the foot, which is tighter. I made minor changes to eliminate any slouch on my pair, as I hate constantly feeling like I need to pull my socks up. I also worked my heel differently where I simply don't like a stockinette heel - I find them too weak against my sock abuses. This was a quick and easy knit. I used KnitPicks Felici in Botany. Anyone who truly knows me knows that my not making the stripes match up perfectly is fully out of character. Usually I like my socks to be 100% identical, down to the stitch when stripes are involved. This simply wasn't an option this time so I went for "wholly out of whack" instead. Pair 1 of 12 complete!